Capitalizing on the renewed interest in and high price of gold the Dubai Multi Commodities Center (DMCC) and the World Gold Council have launched the latest in the Visions of Dubai gold coin series. The new coin features the image of His Highness Sheikh Mohammed Bin Rashid Al Maktoum, Vice President and Prime Minister of the UAE and Ruler of Dubai, on the front and The Palm Jumeirah, one of Dubai’s iconic landmarks, on the reverse. 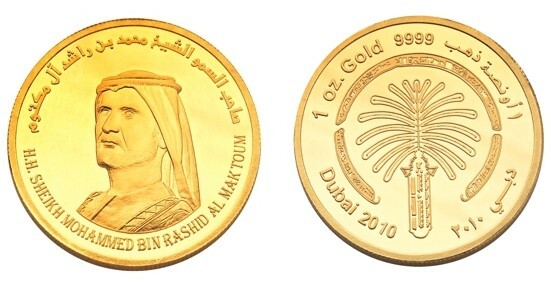 The coin is made of 24-karat (999.9) gold and supported by the World Gold Council. The VoD coins are produced by Emirates Gold Refinery DMCC and the collectibles have been especially designed to represent Dubai to the world, sending the message that the emirate is an important hub for gold in the Middle East region. The coins come in four sizes: 1oz (34 g), ½ oz (17 g), ¼ oz (8.5 g) and 1/10 oz (3.4 g) and are sold through Dubai Duty Free and gold retailers including Siroya Jewellers LLC, Joy Alukkas Group, Mahallati Jewellery and Popley Jewellers. The coins are also being promoted by DMCC through an extensive range of creative marketing activities and promotions. The Woman who cannot feel fear! 18-Month-Old Baby on "No-Fly" List, Baby and Parents Pulled Off From Plane! Jimmy Kimmel to Wed Writer on His Show! Grand Theft Auto V is Coming!! Apophis Asteriod could hit the Earth by 2036! Did Laura Bush Kill a guy ?